We will have sunrise service with a neighboring church this year. 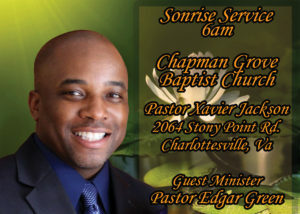 Chapman Grove Baptist Church will Host us and our Pastor Green will minister the word. Breakfast will be served immediately following the “Sonrise” service. Join us at 11am back at Eden Ministries for our very own Resurrection Celebration Service. Invite your family and friends to be with us on this special day. The most important day on the calendar. 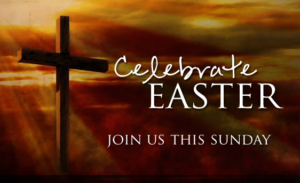 We gather together to celebrate the life, death and resurrection of Jesus the Christ. Anointed praise and worship, dance and word from our Pastor. Join us and bring a friend. Resurrection service is powerful. Our annual spring revival is upon us. Invite a friend and be in the house on Friday night! 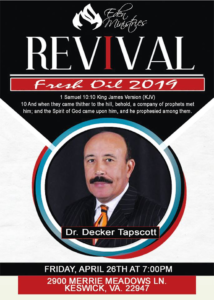 Dr. Tapscott is a gifted, anointed preacher and is a friend of our ministry. We are excited about “Fresh Oil”, a fresh word and a fresh encounter with the Lord. Be present! 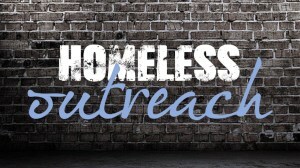 The Homeless ministry is headed up by Deacon Raleigh Stallworth on the 1st Saturday of every month. It’s a time to demonstrate the love of Christ and meet them where they are. Moving outside the church walls because “What you’ve done to the least of them, you’ve done unto me.” A group will meet at the church for prayer and collecting items to distribute to those in need. The van usually departs at 9:15am to minister throughout the Charlottesville area.